Former India cricketers Mohinder Amarnath and Balwinder Singh Sandhu have come on board to lend their support to the team of upcoming Hindi film ‘83’, which will bring alive on the big screen the story of India’s 1983 Cricket World Cup victory. Saleem, who celebrated his birthday on Monday, has been learning the tricks of the game from Amarnath. “Here’s wishing the actor, who has a knack of getting into the skin of his characters, a very happy birthday! Watch him slay the role of the ‘comeback king’ Mohinder Amarnath in ‘83’,” read another post by Reliance Entertainment, along with a picture of Saqib trying to get the spin right. The film’s lead star Ranveer Singh, who will play Kapil Dev, was super excited to have Amarnath during the film’s team’s practice sessions in Dharamsala. “JIMMY!!! 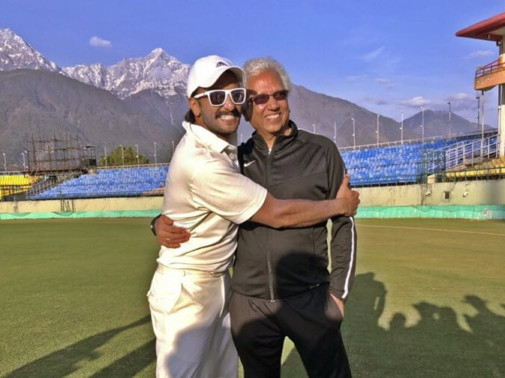 It’s the one and only, champion of champions Mohinder Amarnath,” Singh wrote along with a photograph in which he is seen hugging the former cricketer. The film’s team will head to London next month for shooting.